“Whatever I communicate to you, my son, does not belong to you alone, but it is for all my priest-sons, whom I love with predilection. Above all it is for the priests of the Marian Movement of Priests whom I love most tenderly and whom I want to form and lead by the hand to prepare them for their great mission. And thus, by means of these messages, Mary began to make use of Fr. Gobbi as a humble instrument to gather all priests who would accept her invitation to consecrate themselves to her Immaculate Heart, to be strongly united to the Pope and to the Church in union with him, and to bring the faithful into the secure refuge of her motherly Heart. Thus a powerful cohort would be formed and spread throughout every part of the world, created not with human means of propaganda, but with the supernatural power that emanates from silence, prayer, suffering and constant faithfulness to one’s duties. In September of 1973, the first national gathering took place, with twenty-five priests taking part out of the eighty already enrolled. Beginning in 1974, the first cenacles of prayer among priests and faithful took place. These gradually spread, and by the end of 1996, Fr. Gobbi had many times visited the six continents. The M.M.P. has succeeded in expanding in a powerful and extraordinary way. In practically all the countries of Europe, America, Asia, Africa and Oceania, National Headquarters have been established and entrusted with the task of gathering the membership and assisting in the formation of prayer cenacles. The worldwide membership of the M.M.P. now numbers at least 400 cardinals and bishops, more than 100,000 priests, and millions of religious and faithful around the world. …the Marian Movement of Priests was initiated in 1975, with a temporary Headquarters in Lewiston, Maine. In 1977, its National Headquarters was permanently established in St. Francis, Maine, on the banks of the St. John River that separates Canada from the United States. Our Lady’s choice of St. Francis as the home for her U.S. Headquarters is truly a meaningful one. It was St. Francis of Assisi who was called by Jesus to go “rebuild his Church”, and Our Lady’s Marian Movement of Priests has been called by her to this same mission. As of the year 2000, the M.M.P membership in the U.S. has reached sixty-three thousand, including four thousand members of the clergy – bishops, priests and deacons. Diocesan priests from all 50 states are enrolled, as well as women and men religious from hundreds of communities. In addition to the existing membership, thousands have since gone on to their eternal reward. Our Lady’s cohort is forever expanding in heaven as well as here on earth. Fr. Gobbi died in Milan, Italy at 3:00 PM (local Italian time) on June 29, 2011, the Solemnity of Saints Peter and Paul. He had been hospitalized since June 19 after suffering a heart attack. All of the national and regional directors of the MMP were gathered for their annual spiritual exercises at the Shrine of Merciful Love in Collevalenza, Italy from June 26 – July 2. Fr. 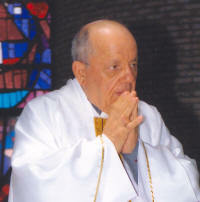 Gobbi’s body was taken from Milan to Collevalenza on June 30, where a Mass was presided by Cardinal Ivan Dias. 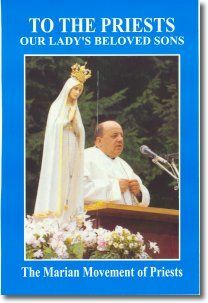 That same day, his remains were returned to Dongo, Como, Italy (his birthplace) where the funeral Mass was celebrated on Saturday, July 2, the Feast of the Immaculate Heart of Mary. I accept death however and whenever the Lord desires, renewing in the Immaculate Heart of Mary my “Yes” to the Divine Will. I leave as my spiritual testament everything that is written in the book, “To the Priests, Our Lady’s Beloved Sons,” and I attest that the messages contained therein were received by me under the form of interior locutions. In a spirit of thanksgiving to Our Lord and to Our Lady, I ask that, after my funeral Mass, the Magnificat be sung by all. I ask for a very simple funeral. In lieu of flowers, I request that works of charity be done. I desire to be buried in Dongo, in the Shrine of Our Lady of Tears, at the foot of the Altar of the Crucifix. If that is not readily available, then I ask for a temporary burial in the Chapel of the Clergy in the cemetery in Dongo. As I have consecrated every moment of my life, in the same way I consecrate to the Immaculate Heart of Mary the moment of my passing from earth to Heaven and from time to eternity. I thank everyone for all the good that I have received. I ask pardon if I have involuntarily offended anyone. To all members of the Marian Movement of Priests and of the Marian Movement, I promise my special protection and a particular help from Heaven where I hope to enter through the mercy of the Lord and with the help of your prayer. I bid you goodbye, as I look forward to meeting you under the glorious mantle of the Queen of All Saints, and I bless you in the name of the Father and of the Son and of the Holy Spirit. Amen.